The Reporter is in the business of highlighting the people at McGill, their successes and the important work they are doing. However, at the end of each year we turn the focus inward to tell you how we’ve done – and we’re happy to report that it is a feel-good story. With more than a week left in 2015, the Reporter has already broken its record for most page views with 587,165 (as of Dec. 21 at midnight). With a bit of a push we may even be able to break the 600,000-view barrier by year’s end (Feel free to stuff the ballot box by revisiting your favourite Reporter stories). Thanks to various analytic tools, we’re able to gather data on everything from how many people read an article on our website, to how long they stayed, to where in the world they were when they clicked on one of our stories. True to McGill’s reputation as one of Canada’s most international schools, we attracted readers from 208 countries (down slightly from 216 last year), from Angola and Azerbaijan to New Zealand and Zimbabwe. The Top 5 countries in terms of Reporter sessions (which may include reading several articles in one sitting) remained unchanged from last year. Of the 417,000 Reporter sessions this year, Canada led the way (with 323,918 sessions), followed by the United States (44,543), the United Kingdom (6,018), France (4,508), and India (3,333). The Top 10 was rounded out with three countries from last year – Australia (2,200), Germany (2,112) and China (1,294); and two newcomers, Brazil (1,324) and Switzerland (1,312), bumping out Japan and Italy from last year. And while most of our readers came from large, well-known countries, we also had people logging onto our site from places well off the beaten track, including São Tomé and Príncipe (Africa’s second-smallest country), Vanuatu (a South Pacific Ocean nation made up of roughly 80 islands) and Timor-Leste (a Southeast Asian nation occupying half the island of Timor). On average, the Reporter site drew 49,000 page views per month in 2015. Our two slowest months were July (29,153 page views) and August (29,590 page views) – not surprising considering how quiet the University becomes during the summer. As with every year, however, McGill – and the Reporter – roared back to life at the beginning of the fall semester. This was reflected by the 80,328 page views for September – our second biggest month of all time behind January 2013 (104,017 page views). A quick scan of our most popular stories for 2015 reveals the incredible scope of interest and activity of the McGill community. It also tells us a bit about our readers. Our most viewed story was McGill among top 25 in QS rankings for 12th straight year – proof that everybody loves a good rankings story. 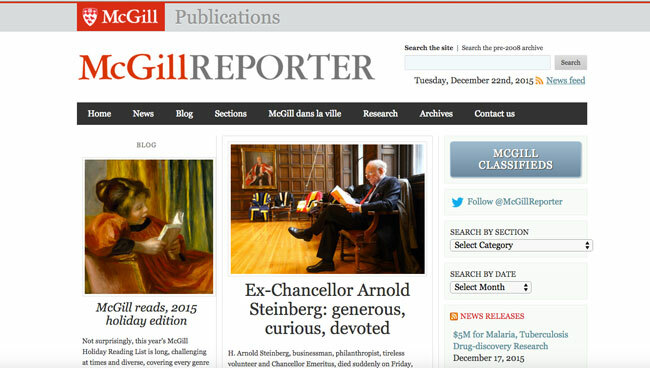 Along those lines, the 14th most popular story was McGill tops Maclean’s 2016 rankings. Another feature that people love? Photo galleries. Three galleries made it in our Top 10 list. Spring 2015 Convocation in pictures was our second most popular story while Postcards from around the world, in which people shared their summer vacation pictures, came in at eighth and Fall Convocation in pictures was tenth. Our third most read article was the breaking story and subsequent updates of the fire at the Royal Victoria College. Interestingly, the article about the community’s response to the RVC fire (McGill, Montreal pull together for students in aftermath of RVC fire) came in at No. 7 on our end-of-year list. Readers also like profiles of interesting people. Leading the charge on that front was Thibault Trancart, the first blind student to graduate from the Desautels Faculty of Management. The feature on Trancart, A man (and a dog) on a mission, was the fourth most popular story in 2015. Our profile of Kazumi Fraser Hoshino-Macdonald, McGill’s most recent Rhodes Scholar (Taking the Rhodes less traveled) is currently in sixth spot but still garnering lots of readers and could move up a few places by year’s end. An honourable mention goes to Arts undergrad Hannah Taylor, who has been an advocate for the homeless since she was five. Our feature on her (Hannah Taylor: Wrong turn sets her on the right path) occupies the thirteenth spot on our list. Finally, but not surprisingly, politics was a big draw to our site this year. Justin Trudeau: From McGill to 24 Sussex was the fifth most read Reporter item this year. Twenty-five McGillians off to Parliament was No. 9 and our item on voting on campus (How students can vote on campus) was eleventh.